With a repertoire spanning from J.S. Bach and Domenico Scarlatti to Jimi Hendrix and Elliott Carter, Michael Nicolella is recognized as one of America's most innovative classical guitar virtuosos. He has received wide critical acclaim for his performances, recordings and compositions. As a concert artist, Michael has performed throughout North America, Europe and Japan as solo recitalist, chamber musician and soloist with orchestra. Nicolella blurs the lines between musical styles and disciplines. He is part of a growing trend in classical music to revitalize the role of the composer/performer. 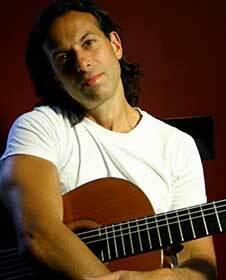 As a concert artist he frequently programs his own works for guitar in solo, chamber and orchestral settings. His most recent major piece, “Flame of the Blue Star of Twilight” (for soprano, guitar and orchestra), received its premiere performance by the Northwest Symphony Orchestra with soprano Alexandra Picard. Known for his creative programming, Michael has introduced electric guitar into his "classical" programs and extended the repertoire and audience of his instrument not only with his own compositions and transcriptions, but also by premiering and commissioning works by some of today's most exciting emerging composers. Michael has premiered dozens of new works for classical and electric guitar in solo, chamber and orchestral settings. In reference to his abilities on the classical and electric guitar, noted guitar composer, scholar and critic John Duarte stated in an issue of "Gramophone" magazine that: "Others have 'crossed the track' in one direction or the other but none has done so with the technical and/or musical success as Nicolella, who,chameleon-like, achieves comparable distinction in both fields". Michael's newest recording is a double CD of his arrangement of the "Complete Bach Cello Suites" released on September 23, 2014. His previous four critically acclaimed releases were albums of contemporary music for classical and electric guitar. Three solo albums ("Ten Years Passed," "Shard" and "Push") all featured works composed by Nicolella (including an electric guitar concerto and a classical guitar concerto); as well as music written for Nicolella and recent masterworks by: Toru Takemitsu, Luciano Berio, Elliott Carter and Steve Reich. The 2002 album "Transit," is a 45 minute magnum opus written for Nicolella by composer John Fitz Rogers for electric guitar and computer generated sound. Nicolella has collaborated and performed with a wide range of artists including: the Seattle Symphony, Merce Cunningham Dance Company,Northwest Symphony Orchestra, soprano Alexandra Picard, jazz singer Johnaye Kendrick, Seattle Chamber Players, Charanga Danzon, prog rock legend Jon Anderson, Seattle Modern Orchestra, Broadway stars Bernadette Peters and Brian Stokes Mitchell, classical music comedians Ingudesman and Joo, violinist Gil Shaham and the Seattle Guitar Trio which performed Michael's groundbreaking arrangement of Stravinsky's "Rite of Spring." As a performer and composer, he has received awards from ASCAP, the American Composers Forum, 4Culture, Wisconsin Arts Board, Washington State Arts Commission, Seattle Arts Commission and was first prize winner of both the Portland and Northwest solo classical guitar competitions. Michael is a graduate of Yale University, Berklee College of Music and the Accademia Chigiana in Siena, Italy. He is on the faculty of Cornish College of the Arts in Seattle.